09/23/2012 3:58 PM - This past Saturday, the Beaverdale community kicked off the fall season with their annual Beaverdale Fall Festival Parade. 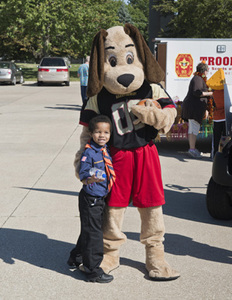 The Iowa Barnstormers were once again a contributing factor to the fun as players, dancers, fans and members of the front office all gathered to walk and represent the organization, handing out a variety of goodies to all of those in attendance. While Beaverdale has been struck with unfortunate weather circumstances for the last couple of years, everyone was able to truly enjoy the celebration this year in the warmth of the sun. The Iowa Barnstormers would like to thank everyone who participated in the parade, with a special thanks to our PA Announcer, Scott Casber, for his initiative in getting the organization involved! Don't forget, season tickets are on sale now! Call the Barnstormers Front Office at 515-633-2255 for more information and to order your tickets today!